Our lives are full of sensory experiences. We take in information about the world around us through our senses – we touch, move, see, hear, taste and smell. Many people with autism have difficulties interpreting this sensory information. Sensory sensitivity can significantly impact an individual’s behaviour and ability to develop independence in life skills. 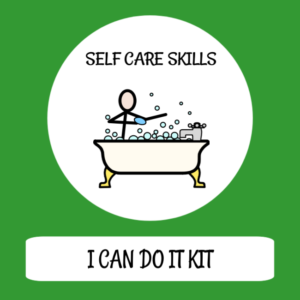 Here are a few of the personal care strategies that have helped me to better manage my son’s sensory-driven behaviours. It’s important to talk to the young person to try and understand their individual issues and to explain each step of what you are doing to help them. Visual aids can also be used to help the young person understand the activity and remember the order or sequence of actions. 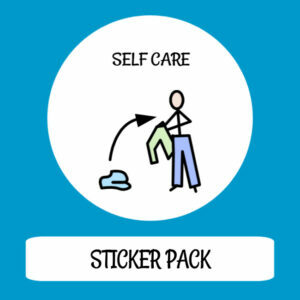 Our TomTag self care pack is designed to help guide self care tasks such as dressing, washing, toileting etc. We also recommend Little Grippers socks which use “stay on technology” to help them to stick rather than grip the skin so they don’t fall down or move around. For more tips, this friendshipcircle blog has some really useful information. Please feel free to share and let us know which strategies have worked well for you. Waiting for others to come to you? How to develop conversation and pragmatic skills in autistic children – a personal view. Like many people on the autistic spectrum my son has difficulties with conversation and pragmatic skills (the social use of language). For example, if we have visitors over it’s embarrassing when, after an hour or so, he will say to them “Are you going now?”. It’s not that he’s being rude, it’s just that he’s still learning how to use language appropriately in social situations. Now that he’s a teenager, keeping up with adolescent conversations is a real struggle as they tend to be fast paced, flitting in and out of topics and replete with metaphor, innuendo and sarcasm. We have been fortunate enough to work with a very skilled speech and language therapist who has introduced the concept of conversation as two-way traffic and has been working with him using a highly individualised intervention programme. Over the last 4 years my son has been taught the anatomy of a conversation – he’s learnt about greetings and conversational openings, how topics develop and how they’re used to keep the conversation going. He still needs help in initiating conversation topics so we use a Conversation Topics book where he lists what he knows about an individual – things like their job, hobbies and interests and also what they talked about last time. The aim is to use this visual resource to assist him in generating a topic and enable him to use specific questions to follow up on something previously discussed. It’s a time-consuming process and will require lots of practice. He will need continued support and opportunities to develop his conversational skills but I believe it will be time well invested. Like every parent, I want my child to enjoy the experience of having friends and close relationships. The reality is – if you can have a conversation, you can have a relationship. The first quarter of 2014 has seen us out and about with TomTag again. We introduced our new information resource packs for professionals which have been really popular. 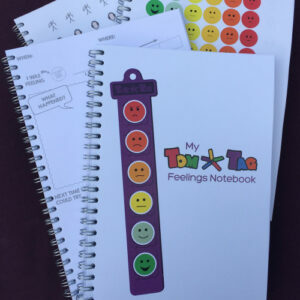 Feedback suggests you are finding these a great way to present TomTag as a useful resource to the families you are working with. In February, we braved the high roads and high winds to get to the Autism Networks Conference in Crewe and then headed south tothe Greenmead Equipment Fair in London. March brought us nearer home with trips to Leeds for the EPIC SEN Martketplace and Starting Point Live, Wakefield’s information Market Place event for families of disabled children/children with additional needs. We even managed to collect a few pebbles from the beach at South Shields on the way home for the Listen 4 a Change information day! We rounded off the month in the Midlands at the fantastic Autism West Midlands Conference where we had the opportunity to speak to some adults with autism and ASD who said they would have loved to have had TomTag when they were younger. Good to know we’re on the right track! 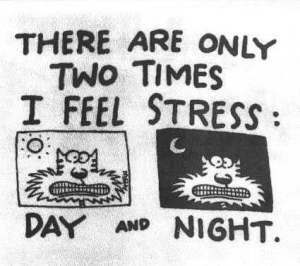 We all experience stress during our daily lives but for many autistic people the experience of stress can feel very intense and cause severe difficulties. Like many young people with autism, my son has been experiencing anxiety related to an overly-literal understanding of what it means to follow school rules and when he is faced with an unplanned change both inside and outside the school setting. He has a very narrow view of what it means to be in the correct uniform or be on time for lessons or appointments. When he is feeling stressed he will rock on his feet, pace the floor and ask repetitive questions. In these situations, he finds it difficult to respond to any reassurance. Together with his Speech and Language therapist (‘SLT’) and Occupational therapist (‘OT’) we have been using some strategies to help him. We have taught him that the concept of feeling overwhelmed means either too many feelings all at once or a very strong reaction to a situation. He can now use this word to express how he is feeling. 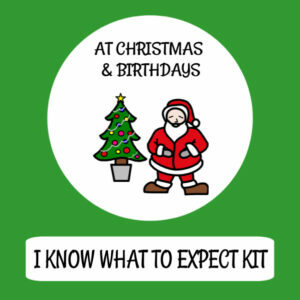 He has been taught a format for identifying the worry and setting out actions to help resolve it. The actions relate to what he can think, say or do to make things better. 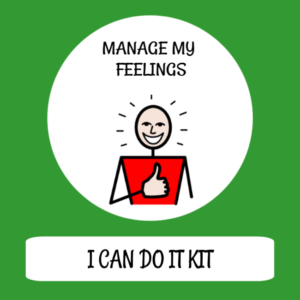 We’ve taught him the phrase self talk and he is beginning to understand what a trusted adult would do or say to him in that situation to help and to use this as self talk. We are sharing this work with his teachers and support staff to ensure a consistent approach to talking about worries and solutions. On the suggestion of my son’s OT we are trialling a tactical breathing programme developed for the military and emergency services to use in times of extreme stress. We wanted to have activities that were discreet and applicable to the classroom environment. Tactical breathing is a great strategy as no one needs to know that he’s doing it and he can use it to prepare for stressful situations as well as once he is feeling stressed. We’ve incorporated tactical breathing into an anxiety busting resource for him called the 3 O’s- Overwhelmed, OT, OK.
One of the resources we’re using is a simple free app called ’Tactical Breather’ which I’ve downloaded onto his phone so it’s readily to hand for stressful situations. I’m also encouraging him to use his phone to record worries and solutions so that these can be kept and built up to form a ‘library’ of helpful strategies for managing situations. It is hoped that over time and with continued support in this area he will become more able to self soothe and manage his anxiety. Incidentally, studies have shown that stress levels of mothers of kids with autism are similar to that of combat soldiers. Perhaps I should download that app for myself too!